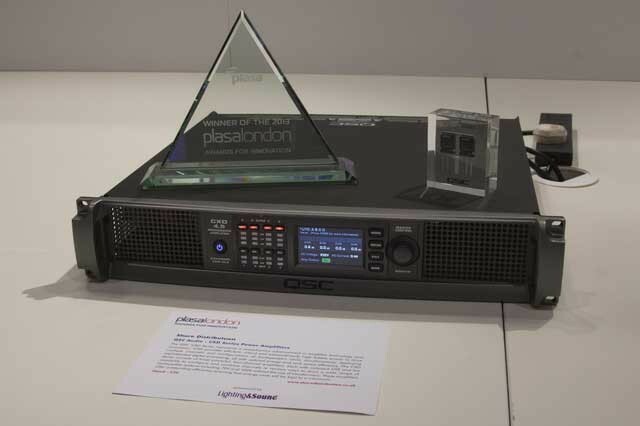 The QSC CXD Amplifier platform introduced earlier this year at Infocomm in Florida was one of eight new products to be recognised with a PLASA Award for Innovation at the recent PLASA London show (October 6-9). Featuring user configurable, built-in DSP, this revolutionary amplifier platform includes Flexible Amplifier Summing Technology (FAST), which allows the amp's total power allocation to be distributed across one, two three or all four of its outputs, enabling amp channels to be combined for maximum current or voltage output, depending on the requirements. The judging panel, composed of industry experts in the field of lighting, sound and installation technology, commented: "This is an incredibly flexible amplifier that can be used in almost any situation. It can be sub-divided and reconfigured, and will work well in installations or as hire stock." "CXD and PLD amplifiers are a reflection of our use of cutting-edge technologies and our deep understanding of power amplification, DSP and loudspeaker engineering and we're delighted to see that the PLASA judges feel the same way," relates Ray van Straten, QSC Sr. Director, Marketing Communications and Training & Education. The PLASA Awards for Innovation are given to products released over the past year that, in the view of the industry judges, demonstrate in their design either a new style of thinking, improved technical practice, new technology, materials or techniques, improved safety or unique intellectual property.